The group was redesignated the 401st Fighter-Bomber Group on 8 February 1954, it reactivated at Alexandria (later England) Air Force Base, Louisiana. A component of Ninth Air Force, it was attached to the 366th Fighter-Bomber Wing. Three former squadrons-- 612th, 6l3th, and 614th--were redesignated fiqhter bomber squadrons and activated with it, while the 615th remained on the inactive rolls. This new assignment to the Tactical Air Command brought a new mission and a new aircraft. The group conducted tactical operations in the F-86 "Sabre" jet fighter. One year later, older F-84F ~Thunderstreak." 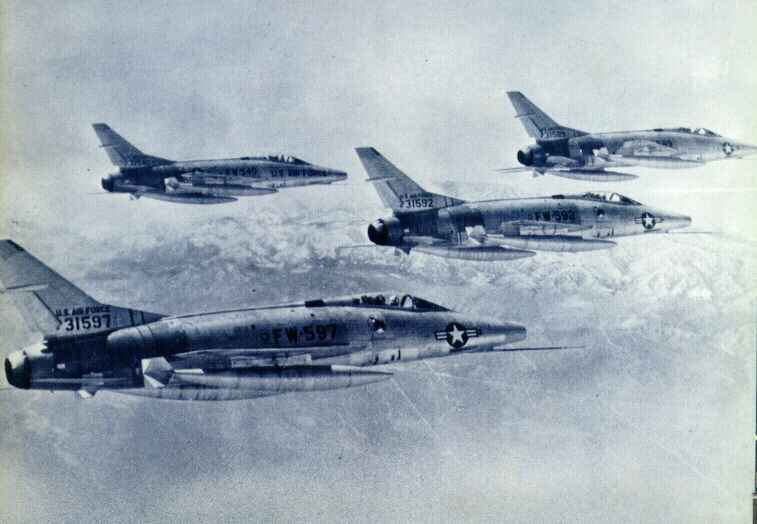 aircraft replaced the F-86s. While at Alexandria, the 613th and 614th Fighter-Bomber Squadrons participated in the filming of Warner Brothers' "The McConnell Story." From 10 January to 10 February 1955, the two squadrons flew 125 sorties during the aerial combat sequences of the film, using eight unit F-84 aircraft painted to resemble enemy MIG-15aircraft flown in the Korean conflict. 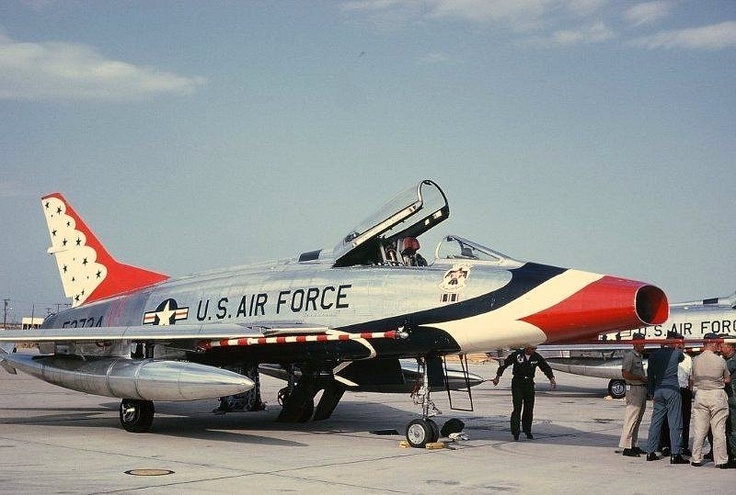 The group gained F-86s in June 1956, when the Sabres replaced the F-84F's, which transferred to the Air National Guard. On 30 June 1957, the 401st transitioned to "Super Sabres," receiving a total of 57 F-100D aircraft. Soon after, on 25 September 1957, the group was inactivated and replaced by the 401st Fighter-Bomber Wing, which absorbed the assets of the group. The 615th Fighter-Bomber Squadron reactivated, assigned to the new wing. Though the 401st Fighter-Bomber Wing was constituted on 23 March 1953, part of an Air Force reorganization which replaced combat groups with wings, it remained on the inactive list until 25 September 1957. This reorganization left most units without a World War II heritage, so the Air Force enacted a program to "temporarily bestow" the history and honors of World War II groups on the like-numbered wings which replaced them. Under this plan, the two units remained separate entities, with the wing keeping the history of the inactive group alive by having partial claim to its World War II honors so long as the group remained on the inactive list. About nine months after its initial activation, on 1 July 1958, the 401st Fighter-Bomber Wing became the 401st Tactical Fighter Wing. Participating in various exercises, the wing set several deployment records, flying from Langley Air Force Base, Virginia, to Chaumont Air Base, France. An early deployment in March 1958 accomplished the trip non-stop for the first time and a later deployment made the trip in a record seven hours and thirteen minutes. The wing responded to the Cuban Missile Crisis in. late 1962 by deploying to Homestead Air Force Base in Florida. Beginning 19 October, the wing remained on alert, ready to respond to any emergency tasking caused by the blockade of Cuba, until resolution of the crisis on 5 December 1962. During 1963, the 401st participated in numerous exercises and deployments, including various NATO exercises, overseas rotations and firepower demonstrations. The exceptional skill with which it met this heavy tasking and earned the wing an Air Force outstanding Unit Award. The wing became involved in the Vietnam conflict, in 1964. Although the unit as a whole remained at England Air Force Base, its squadrons rotated to Clark Air Base in the Philippines, from which one squadron operated at all times. Squadrons flew combat missions from such deployed locations as Da Nang and Bien Hoa Air Bases in South Vietnam, Takhli Royal Thai Air Base, Thailand, and Tainan Air Base, Taiwan. On 3 November 1965, the 612th Tactical Fighter Squadron left the 401st Tactical Fighter Wing for a new assignment at Misawa Air Base, Japan. The 401st gained two additional squadrons, but these units were attached rather than assigned. The wing took operational control of the 531st Tactical Fighter Squadron on 19 November 1965, and the 90th Tactical Fighter Squadron on 5 December 1965. The 531st served less than a month with the 401st before returning to its parent organization the 3rd Tactical Fighter Wing, at Bien Hoa Air Base on 10 December 1965. Additional organizational changes occurred in 1966, when the 614th and 615th squadrons transferred to the 834th Air Division on 27 April. A few months earlier, the 90th was relieved of its attachment to the 401st. These actions prepared the wing for a change of station. On 27 April 1966, the 401st Tactical Fighter Wing was reassigned to Torrejon Air Base, Spain, as part of Sixteenth Air Force. Its non-flying components and the 613th Tactical Fighter squadron accompanied the wing to Torrejon, where it gained the 307th and 353d Tactical Fighter Squadrons, returning to full operational strength. 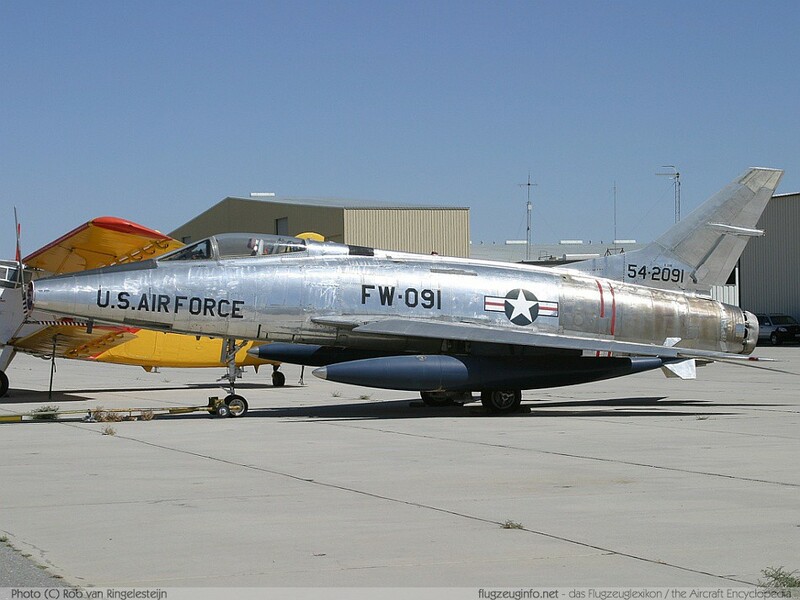 At Torrejon, the wing continued to fly the F-100D "Super Sabre." Major operations consisted of maintaining combat readiness;rotating units to other bases in Europe or the Middle East and participating in various United States Air Force, North Atlantic Treaty Organization and Spanish Air Defense exercises. In addition, the 401st served as the host United States organization at the Spanish base, supporting Air Force tenants. Wing operations remained relatively unchanged until 9 January 1970, when the wing replaced its aging F-100 fleet with F-4E "Phantom II" fighters, completing the conversion in 1971. The 612th and 614th Tactical Fighter Squadrons rejoined the wing, returning from combat assignments at Phan Rang Air Base, Vietnam, on 15 July 1971, replacing the 307th and 353rd squadrons, which departed on the same date.